Imagine discovering the great wines of Bordeaux, some of the world’s most famous vineyards, from the very best vantage point in the gorgeous French countryside - the back of a horse! Exceptional horseback riding with the discovery of the great wines of Bordeaux, the world’s most famous Vineyard. You will ride through prestigious Vineyards that will not leave you indifferent. These are Médoc, Côtes de Blaye, Côtes de Bourg, Fronsac, Lalande de Pomerol, St Emilion, l’Entre deux mers, Premières Côtes de Bordeaux, Graves and Sauternes. All the human heritage such as the Citadelle de Blaye, built by Vauban at the 18th century, the medieval city of Saint Emilion, the chateau de Rauzan and the English bastide of Cadillac (13th century) is also waiting for you. 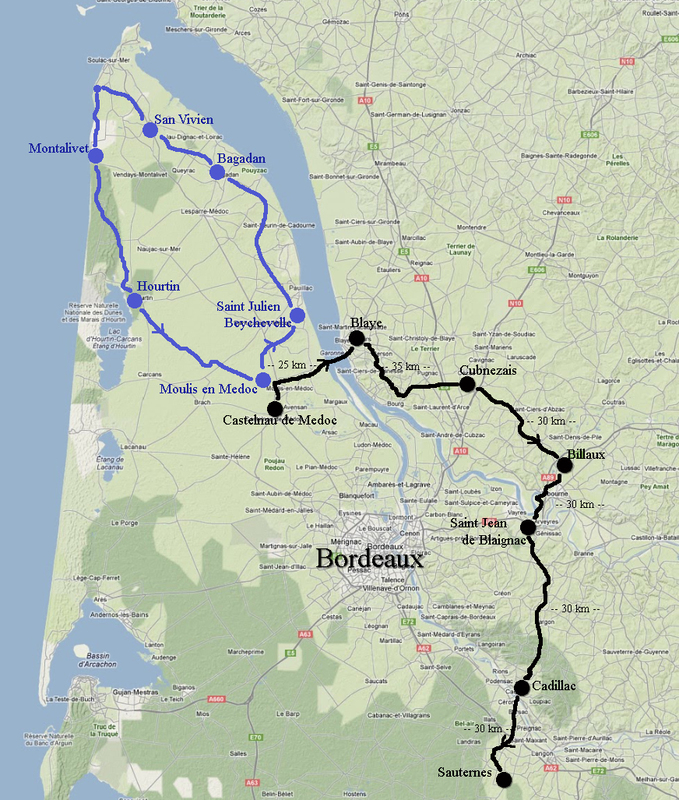 The alternate Medoc Beach & Wine Ride . This trip is by the ocean side, mythical wine châteaux, vast forests, a place redolent of history and famous food. On one side the Atlantic Ocean. On the other, the Gironde estuary and the immense Landes Forest, the Médoc is about a third of the Gironde Department (its North-West). It is first of all world renowned for its vineyards, however its landscapes have a lot of variety, from the marsh areas of Lower Médoc to the large straight beaches of the Atlantic with the ocean breakers. Going by the Graves headlands where the waters of the Gironde and those of the Atlantic Ocean merge, the Landes forest and its mind boggling pine woods stretch as far as the eye can see, a succession of lakes (Hourtin, Carcans, Lacanau) from North to South. Day 1: We welcome the riders either at the Bordeaux airport at 6:30pm (Meeting is in Hall B at the "Brioche Doree" snack bar.). Transfer to the bed and breakfast Domaine de Quittignan Brillette in Moulis. Day 2: Breakfast at 8:00am, transfer to the horses at 9:00am and departure on horseback at 10:00am in a flat landscape between vineyards and forests. Picnic will take place on the borders of the Gironde, and the tasting of Medoc after lunch. We will cross the Gironde, with our horses, on a ferry, towards Blaye (crossing time of 40 mn). Upon arrival we will visit on horseback the citadelle Vauban (18th century). Night at the Porche hotel. Day 3: Breakfast at 8:00am, departure from the hotel at 9:00am and on horseback at 10:00am. 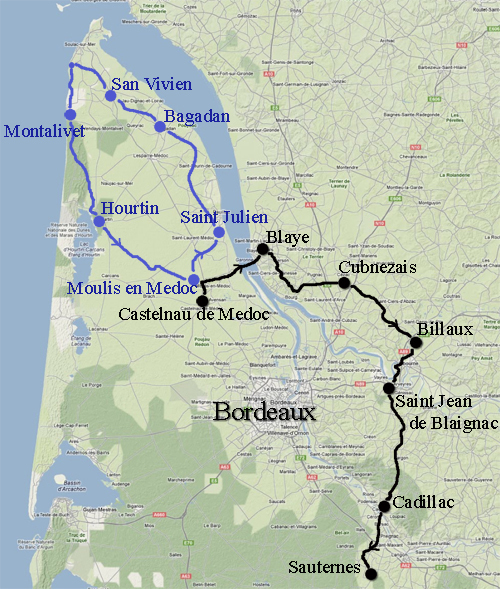 We will ride through the Côtes de Blaye and the Côtes de Bourg in a hilly landscape. Picnic at a wine producers’ place at the Chateau Lamothe and tasting of a Côte de Bourg. Departure at 3:00pm towards Cubnezais, through a flatter landscape, with passages in humid zones without vineywards. The evening will be held at the winegrower of the vineyard Gravette’s. Tasting during the meal. Night onsite. Day 4: Breakfast at 8:00am, departure on horseback at 9:30am. It is a region where vineyards alternate with little forests which will lead us to the castle Mayne Veil, for the picnic and tasting of Fronsac wine. Towards Libourne, we will pass through the famous region of Pomerol. We leave the horses in Pomerol. It is at the castle Belles Graves to taste the famous wine Lalande de Pomerol. We will spend the evening at the La Tour hotel in Libourne. Day 5: We go in the direction of Saint Emilion passing through the famous properties of château Pétrus, Cheval Blanc and château Figeac. Picnic in Saint Emilion with tasting of this wine, followed by a free visit of the city of St Emilion. In the afternoon we will leave St Emilion to ride through the large valley of Dordogne and arrive near the Chateau Courros (tasting wine). by 7:00pm. We leave the horses and transfer to Saint Jean de Blaignac. We will spend the night there in a Bed and Breakfast. Day 6: Breakfast at 8:00 am, departure on horseback by 9:30am. We are now in the region of the l'Entre deux mers, with its varied landscapes, hilly and wooded, and its beautiful wineries. We pass next to the castle of Rauzan (13th century). In the afternoon we will ride through slightly hilly landscapes where vineyards alternate with forests, which will lead us to the castle of Broustaret (Bed and Breakfast). We will have dinner in the city of Cadillac where we will taste the Premières Côtes de Bordeaux, and later enjoy a nocturnal visit of the city. Day 7: Breakfast at 8:00am, departure on horseback at 9:30am. Until Cadillac, the region is very hilly. Then we will pass through the valley of Garonne to reach the vineyards of Graves and Sauternes. Picnic at the castle of Myrat, the Comte of Pontac will show us his castle and will propose a tasting of this gold-coloured wine. In the afternoon gallops between vineyards and forests will lead us to Sauternes. During the meal we will taste the wine of Graves and spend the night at the hotel. Day 8: After breakfast and according to the riders’ train or plane schedules, transfer of the riders. There will be a single transfer to Bordeaux airport. Day 1: We welcome the riders either at the Bordeaux airport at 6:00-6:30pm (hall B at the "Brioche Doree" snack bar). Transfer to Moulis en Médoc. Overnight at the B&B Domaine de Quittignan Brillette. Day 2: Departure from Moulis through the vineyards of the Listrac and Moulis Appellations. Picnic and wine tasting Château Lannessan. End of the afternoon at Pauillac. Day 3: Through the Pauillac Appellation vineyard, we pass not far from Lafite Rothschild (first Grand Cru Classé Pauillac) whose vineyard dates from the XVII century, or Cos d’Estournel (Saint Estephe appellation) dating from 1811. Then, we’ll head for a visit and picnic at the archaeological dig site of Brion. There used to be a Gallo-Roman villa there. Afternoon through vineyards, we’ll then reach Begadan (Bordeaux, Bordeaux superior appellation). Day 4: We’ll head northward on the Palus to get to the banks of the estuary. “Palus” are land ridges between marshes and streams of water. We’ll head for the picturesque seaport of Goulée. Picnic and visit of the Richard lighthouse. From its top (18 m high) we’ll have a beautiful view on the river. Overnight at the hotel a few meters from the ocean. Day 5: Today we will ride westward to Soulac. The landscape looks like Camargue; vast expanses of meadows with lakes and horses on the range. Visit of the church of Our Lady of Land’s end. Then the beach: a very large one to L’Amélie for picnic. Same route in the afternoon, long canters on the beach to Montalivet. Night in a hotel. Day 6: Southward, beach or forest depending on the tide, picnic at the Pin Sec. In the afternoon on the Gironde moors we’ll make it a day at Hourtin, a small yachting harbour. Day 7: Eastward, forest, forest…. Long canters on sandy lanes where we may spot deer or stags. The fragrance of the pine trees is inebriating, the forest is engulfing us. Picnic in the hamlet of Bernos. In the afternoon we’ll go southwards to get back to where we started. Dinner and overnight. Day 8: End of the trip. Transfer to the Bordeaux airport after breakfast. Bordeaux, within Frances’s famed Aquitaine wine region, is located on the bend of the Garonne River in the south west of France. It enjoys a mild climate which is ideal for wine growing, making the region one of the world’s top wine producing areas. The average temperature range in the area sits at around 13 to 25 degrees Celsius, with July being the hottest month. The evenings are cooled by a pleasing Atlantic wind which leaves the area enjoying delightful cool summer nights. Due to its proximity to the Atlantic Ocean, the area is protected from temperature extremes. The months from March until May bring balmy temperatures. However, it is not unusual for weather conditions to relapse back to winter and as a result there are occasional cold snaps interspersed with drizzles of rain. Weather in Autumn is similar to Spring (minus the blossoming flowers!) however the majority of the wineries close their doors in October whilst grape harvest takes place, so keep that in mind if you want to take in what Bordeaux’s wine region has to offer. Summer in Bordeaux is glorious, clear blue skies and sunny days are made all the more enjoyable when taking the atmosphere with a glass of the regions finest red wine. Winters in Bordeaux are short and not too cold but have a tendency to feel quite ‘damp’. November through to January is when the region receives its greatest rainfall. Lodgings are usually at the following hotels, however changes are possible based on vacancy availability! Bring your swimsuit because some hotels during the ride may have swimming pools! Day 2 : Blaye - Porche Hotel. Day 4: La Tour Hotel in Libourne.